From offering delivery service to housing a music studio, Pin Pin Piau Kay owner Rodney Goh shares how he continues to inject new life into the 80-year-old provision shop business. 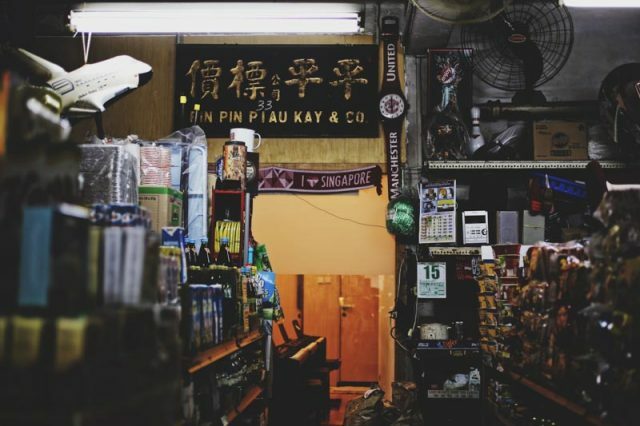 Besides its regular customers, Pin Pin Piau Kay, a provision shop in Tiong Bahru is also attracting many curious passers-by these days. That’s because behind its storefront lies a music studio, which is furnished with a piano and multiple keyboards. Pin Pin Piau Kay has been standing at Seng Poh Road for the last 80 years. It’s older than Singapore as a nation-state. The music studio in the provision shop was built 4 years ago, when Mr Goh’s eldest son decided to run a music business. Mr Goh inherited the shop from his father in 1983. Pin Pin Piau Kay, a traditional provision shop. Photo Courtesy of Terence Tan. The shop used to be bustling with customers, Mr Goh said. It still receives a steady flow of regulars, mainly mothers and grandmothers, but it’s much harder to attract younger customers. “Nowadays most things can be bought online. Next time, if you buy cars, you also don’t need to go to the showroom, just order online,” he quipped. Today, the Singapore Provision Shop Friendly Association has less than 200 members, a glaring difference from the 1,262 members it used to have during the 1970s. “The goods go to the customers, and the customers don’t need to come to the goods anymore,” he added. To survive in times of changing shopping preferences, Mr Goh started a delivery service since about 10 years ago. This allows his regulars to place orders and have what they need delivered to their homes at their convenience. “After doing it several times, we felt that it was a good form of service to continue as the customers were happy,” he said. He added that taking the business online is a way to keep up with the times, and a possible option for family succession of the business. When it’s time for him to retire, he’ll leave it to his children to decide what to do with the shop since it’s still theirs after all.